Inspired to travel to Croatia? Visit Jeanne Oliver's Croatia Traveller. Love to read Historical Fiction? Go to The Historical Novel Society. Want to know more about the history of Croatia? Try Dr. Darko Zubrinic's Croatian History website. Croatia has mostly recovered from the recent war, but eradication of minefields is still ongoing. Want to help? Donations are accepted at the Croatian Mine Action Center. 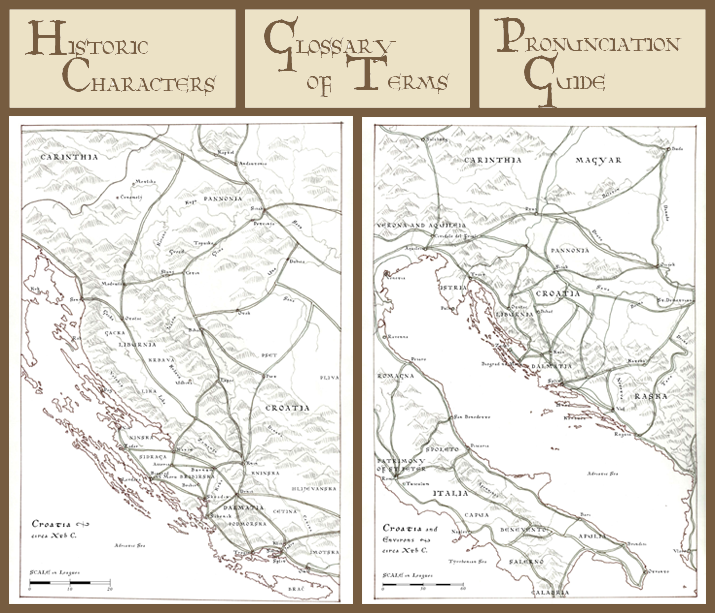 Click on images below to access resources to enhance enjoyment of "Peril of Croatia" including maps of 10th Century Croatia and her environs, a glossary of medieval and Slavic terms, a Croatian pronunciation guide, and a list of historical figures featured in the saga. ©2014 Calibogue Press. All rights reserved.